In 1983, Belgian Rom Houben, engineering student and martial arts enthusiast, was in a terrible accident. It was an accident that left Rom comatose and vegetative state. Days, months, years, decades passed. Wars were fought; governments changed; technology advanced. Many things were transformed, but for comatose Rom Houben there was no change to his sad and altogether hopeless condition. Then one day Dr. Steven Laureys of the University of Liege hooked Houben up to some modern, state-of-the-art, brain-scanning equipment. Dr. Laureys turned on the machinery, and the bells and whistles of his devices lit up like the Fourth of July. The equipment said that Houben was, in fact, not a vegetable; it said he had normal brain function. It was true. For 23 years, totally helpless, unable to communicate, Houben had heard everything said about him. Houben heard when people talked about him as if were already dead. He also noted how, as the years passed by, his friends gradually stopped coming by. Rom Houben could understand. After all, everybody had been told he didn't know if they were there or not. As I read Houben's story, I wondered how lonely, how very lonely he must have felt. What better place to turn then to the Bible. Thinking about all the Bible passages which might have been a help to him. "Out of the depths I cry to You, O Lord! O Lord, hear my voice! Let Your ears be attentive to the voice of my pleas for mercy!" (Psalm 130:1-2 ). And, of course, from the book of Romans, there are these classic two verses: "For I am persuaded, that neither death, nor life, nor angels, nor principalities, nor powers, nor things present, nor things to come, nor height, nor depth, nor any other creature, shall be able to separate us from the love of God, which is in Christ Jesus our Lord" (8:38-39). What great verses for each of to memorize. At some time or another, sooner or later, almost every one of us will feel alone. We may not be in the hospital, and we may not have been diagnosed as brain dead, but we will feel we are alone -- very much alone. 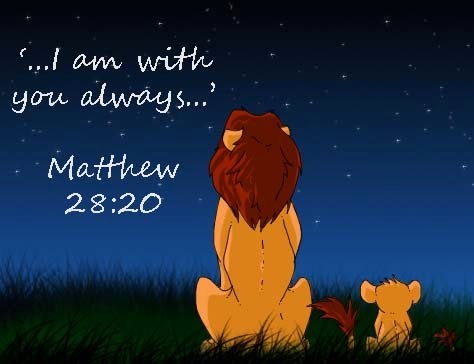 Always remember that we are never alone, God is with us. Dear Lord, Thank You for coming to seek and save the lost, for healing the sick, for being a friend to those who are isolated. May we always remember You are with us. In Jesus’ Name, Amen.